We recommend Aura Glow to beautify the body, promote superficial circulation, and as a massage oil to enhance flexibility. Unlike most moisturizers, Aura Glows all natural formula has no additives or artificial preservatives, so it acts as food for your skin. It rapidly absorbs into the body to be used where it is needed. Warm and inviting, the delicious sweet scent of almonds reminds you of the comfort of home. Pure moisturizing oils and rich almond ground you as your skin becomes supple and resilient. Directions: For best results, apply after a bath or shower and feel it soak into your skin. 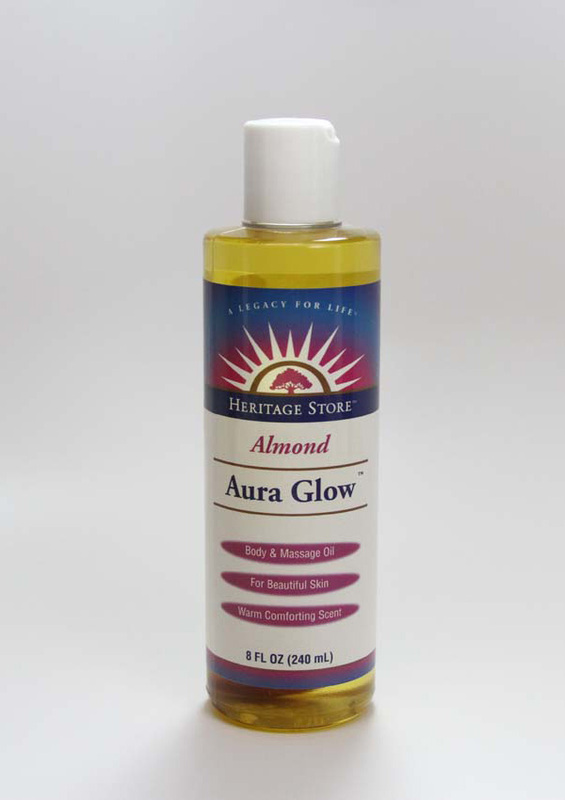 Aura Glow makes an excellent moisturizer, massage formula, tanning oil, after shave lotion, hair oil and bath oil. Peanut Oil, Olive Oil, Lanolin, And Vitamin E (as a natural preservative) Unscented is blend of all natural oils. The rest contain some level of synthetic scents. Vitamin E is 'mixed tocopherols' - this means mixed sources, however, none are wheat sources - Vanilla-Spice scent is comprised of Vanilla Perfume Oil, Clove Oil, Cinnamon Oil, and Wintergreen Oil. Keep out of reach of children. Avoid contact with eyes. If irritation, redness or discomfort occurs, discontinue use and consult a licensed health care practitioner. Store tightly sealed in a cool, dry place.